International funding to support education in poorer countries is "stagnating", says a Unesco report, despite campaigns calling for more investment. 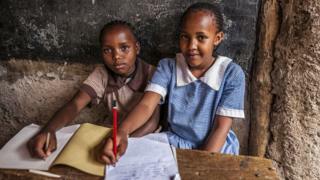 Overseas aid for education stands at about $12bn (£9bn) - which Unesco says is 4% less than in 2010. The UN agency says the funding gap means global targets for access to school are unlikely to be achieved. The US and the UK remain the biggest donor countries for basic education. Unesco's Global Monitoring Report says that despite warnings about the importance of raising education standards, international aid funding is falling behind. The UN agency says there is a $39bn (£30bn) annual shortfall in the financial support needed to reach education targets set for 2030, such as ensuring a primary school place for every child. When the targets were set in 2015, the UN says there were more than 260 million young people without access to school, with serious consequences for their future wealth, health and security. The most recent figures show a slight annual increase - but Unesco warns that the amounts being targeted at education have "stagnated" and are below the levels at the beginning of the decade. The report says that for the sixth year in a row, education has had a declining proportion of the overall overseas aid budget. Health continues to take a much bigger slice of aid budgets - with aid support for transport now matching the amount donated for education. Poor girls living in rural areas in low-income countries are particularly at risk of missing out on school. At the current rate of progress, Unesco has forecast that it will be 2042 before universal access to primary school is achieved. It will be 2084 before all young people will have the chance to stay on for upper secondary school, the UN says. The UN report also highlights that the poorest countries are not necessarily receiving the most aid. Unesco says that sub-Saharan countries account for half of the world's children out of school, but these countries now only get about a quarter of the education aid budget. The report says an increasing amount of support is going to countries with refugees from Syria's civil war. Conflict and war have become a significant factor in denying millions of youngsters a chance of an education. Overseas aid budgets are also being spent on supporting refugees within the donor countries - and in a number of European countries, about a fifth of international aid is spent within their own borders. The UN agency has also warned of education aid being targeted by donor countries towards their own trade interests, rather than towards those in the greatest need. Unesco argues that improving education standards will have far-reaching economic and social benefits. This applies to developed as well as developing countries. Unesco says that in the United States, if 5% more male teenagers graduated from high school, it would add $20bn to the economy in reduced crime and higher earnings. Child mortality rates in sub-Saharan Africa would improve, says the UN, if more mothers were literate and could access medical advice. There are also big differences in access to education within countries. In low-income countries, for every 100 wealthy children who complete primary school, only 30 children from poorer families reach the same level of education. The report shows the countries and organisations that have given the most direct funding to basic education. Despite warning of a "chronic" funding gap for education, the UN report highlights where some donations have increased. The war in Syria and the displacement of millions of families prompted a big increase in emergency humanitarian aid for education, to a record level of $300m. Unesco's director general, Irina Bokova, said that the aid shortage was putting international education pledges "at risk". "Aid would need to be multiplied by at least six to achieve our common education goals and must go to countries most in need. "Yet, we see that donors to education are shifting their attention away from the poorest countries," said Ms Bokova. Why can’t the world keep its promises?